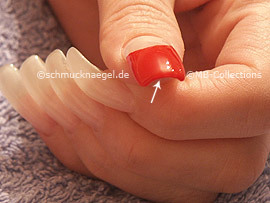 Paint the front part of the fingernail with the nail polish in the colour red. Try to apply evenly the colour, so that no irregularities are to be seen. 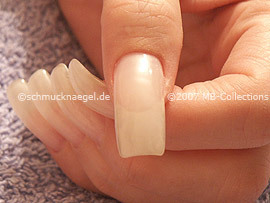 If you have synthetic fingernails you should pay attention that the edge of the fingernail is also painted. This causes a perfect and consistent look of your fingernail. You have to continue with step 2, before the nail polish is dried. 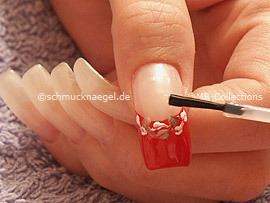 Now draw with the nail art pen in the colour white several points on the damp nail polish. The motif with dollar symbol should correspond approximately to the picture. You have to continue with step 3, before the nail polish is dried. Now draw with the nail art pen in the colour silver several points on the damp nail polish. You have to continue with step 4, before the nail polish is dried. Set the spot-swirl or toothpick in the center of the first white point on the left side of your fingernail. Pull a swung line from one white point to the next white point. Now set the spot-swirl or toothpick in the center of the first silver point and pull a swung line from one silver point to the next silver point. 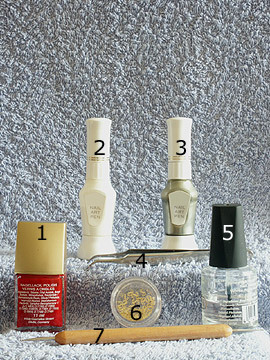 Before you continue with step 5, wait until the nail polish on the fingernail is dried. 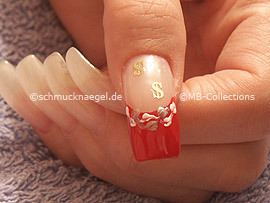 Set a drop of the clear nail polish left above on the free fingernail surface for a motif in the form of the dollar symbol. 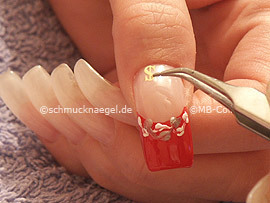 Now set a further drop of the clear nail polish right above the smile line on the free fingernail surface for a further motif in the form of the dollar symbol. 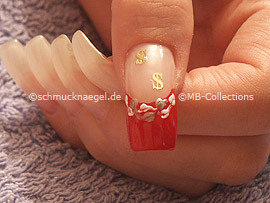 Take up with the tweezers a motif in the form of a dollar symbol and set it left above on the damp clear nail polish. 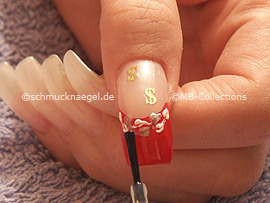 Now press with the tweezers the motif firmly to the nail surface. 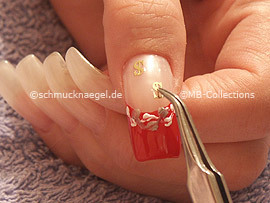 Now take up with the tweezers a further motif in the form of a dollar symbol and set it right above the smile line on the damp clear nail polish. 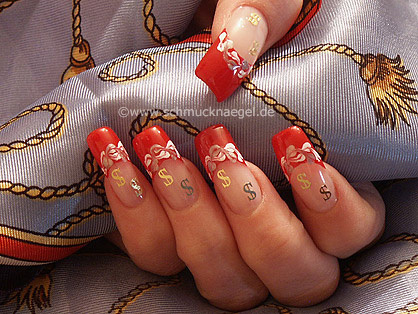 The nail art motif with dollar symbol should correspond approximately to the picture. 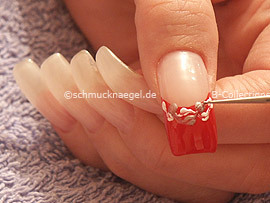 Before you continue with the last step, wait until the clear nail polish on the fingernail is dried. At the last step you have to paint over the entire fingernail with a clear nail polish. The clear nail polish protects the nail art and gives the fingernail more gloss. 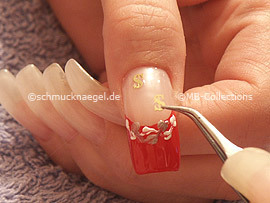 After the clear nail polish is dried, the nail art motif with dollar symbol is finished. We hope that you liked the free nail art guidance and we would be happy, if you recommend our website! If you have any suggestions to make our website or our instructions better, please contact us. Send an E-Mail to suggestion@schmucknaegel.de. 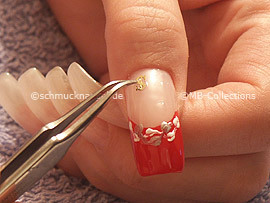 Our team thanks you for your help and wishes you much fun trying the free nail art instructions by MB-Collections. Motif with dollar symbol was last modified: June 18th, 2016 by Make it Smart e.K. Inlay motifs, Nail art pen, Nail polish.